NEWPORT, NH–At 8:46 p.m., Sunday, the Newport Police Department Emergency Communications Center received a 911 call reporting heavy smoke and confirmed fire emitting from 146 Laurel Street. Newport Fire/EMS and Police Departments were dispatched to the scene with the first units reporting that the structure was fully involved. 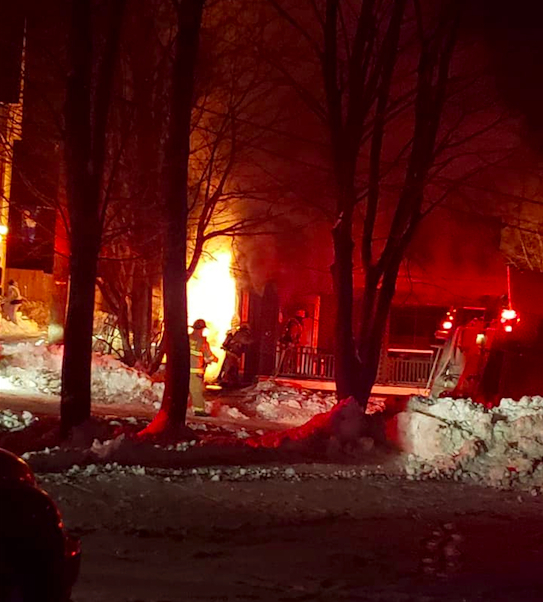 At 8:53 the fire was upgraded by Fire Command to a 2nd alarm, bringing in Fire Departments from the Towns of Sunapee, Lempster, Claremont, New London, Goshen and Unity; all responded to the scene with Croydon and Newbury Fire Departments providing backup station coverage. Laurel Street was closed to through traffic. The road remained closed for nearly four hours. The fire was deemed under control at 11:26 p.m. However, due to the extensive nature of the fire, fire personnel remained on scene for several additional hours overhauling and addressing hot spots within the single family residence. Challenging the responding fire departments was the extremely cold temperature. One cat perished in the fire, and another cat is believed to have escaped. The exact cause and origin of the fire remains under investigation at this time. The investigation is being conducted by the Newport Police Department and the NH State Fire Marshal’s office. Anyone with information is encouraged to contact the NH State Fire Marshal’s office, Investigator Booth at (603)223-4289 or the Newport Police Department, Det. Hallock at (603)863-3232. (Photo courtesy of Amber Jewel).